In just 11 days Pickle will be 3 years old! 3!!!! How is that even possible?!?!? 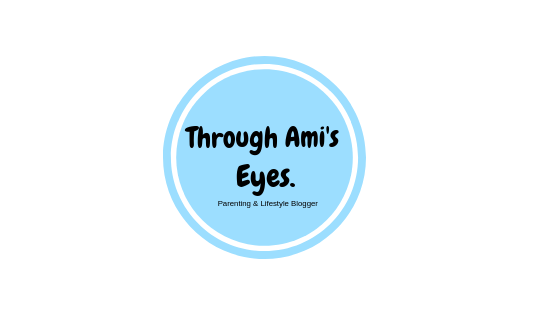 But rather than sobbing to you about how big my little baby is getting and how I wish time would slow down a little bit, I thought I would share with you something more fun. 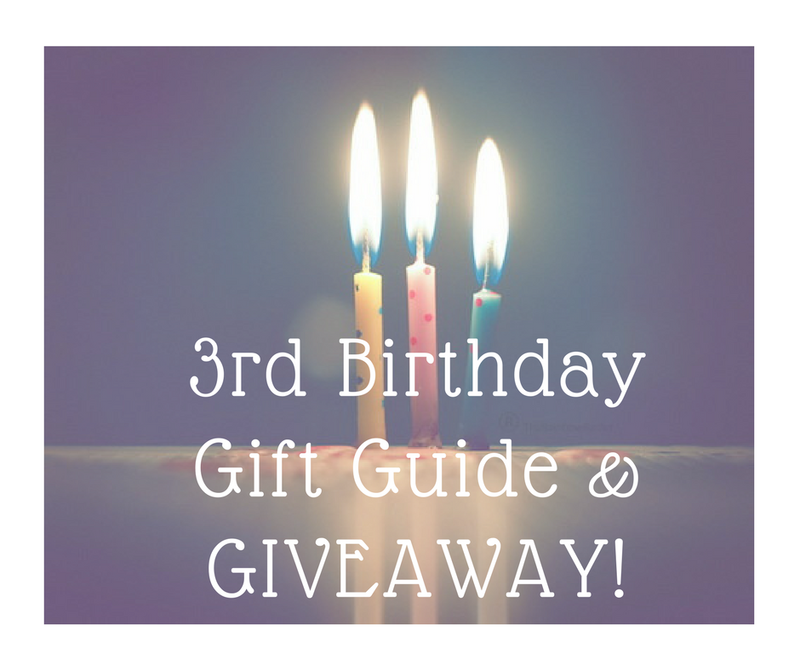 So here is my 3rd Birthday Gift Guide!! 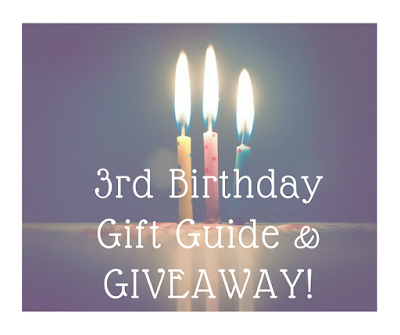 I haven't specified if this is for boys or girls as I think either would love the ideas on this list but I do think the ideas are perfect for a 3rd olds birthday AND make sure you read until the end for the chance to win an amazing prize!! We have got Pickle one of these for his birthday and I am so excited about it! The more eagle eyed among you may have picked up on the fact that we actually brought Pickle a trike for his 1st birthday but the handle broke and the customer services team from the company we brought it from (this trike was NOT a little Tikes one) were extremely unhelpful so Pickle has been trikeless for almost a year now. This Trike looks like the perfect replacement. It seems a lot steadier than the previous make we had and I love that it is a 5 in 1. I will be doing a full review on here once we have had a chance to really test it but so far it seems like the perfect birthday present. You can grab your own trike for only £129.99 here. I love these little things and I think Pickle will love the Spider-Man and Ironman ones that we have got for him. They are basically small plush toys but at only £5-£6 per character they make a perfect small gift. Pickle loves little toys like his and has a whole range of Disney Tsum Tsums that are around the same size as the Itty Bittys so I think these will add to his collections perfectly. This may sound like a strange one but stick with me here. Pickle (like thousands of children in the U.K.) loves minions. Pickle also sometimes gets belly aches and loves to snuggle up with his cuddly toys. 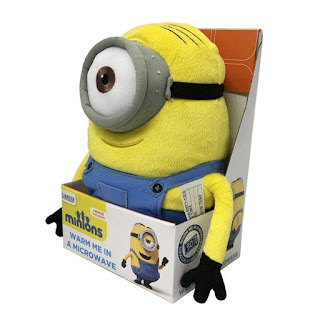 This minion from Findmeagift.com is microwavable so not only will it give him perfect snuggles it will help soothe a poorly belly too. And for just £14.99 your winning all round! Pickle has recently become really interested in playing games with us. We got a very tiny version of pop up pirate for him when we went camping a while ago and he loved it so for his birthday we have got him the full version of pop up pirate and also hungry hippos. I think he will love these as they are easy to understand and play and a great way for us to play together as a family. What child doesn't want a scooter?? I remember having one, I remember my brothers having one and it seems like even after 20 odd years the scooter craze is still going strong. I found a website called Skates.co.uk and they have a website full of scooters and ,you guessed it, skates. The most popular scooter they have is called the JD bug and I think Pickle would love it!! What more exciting is that you can get the little person in your life their very own!!! Just follow the instructions on the giveaway below to be in with a chance to win your own JD big original street foldable scooter in Matt black worth £54.95!! note: some of these products have been sent to use for the purpose of this gift guide but al opinion expressed are honest and my own. I would love to win this prize to give this to me niece! I would love to win this for my daughter Heidi, super fun giveaway! My eldest son would really appreciate this! I would love to gift this scooter to my nephew. My son. He needs a new scooter because his old scissor scooter has broken. He'd love this. I would give this scooter to my son. I would gift the scooter to my niece for when she's a little older. My niece is just old enough for a "real" scooter. It would be great for my daughter! My little boy, he'd LOVE it! Oh wowee, my little boy would just love this!! My nephew. A scooter is top of his birthday list! My son would probably be first to claim this! I would give this to my son for Christmas as he has outgrown his first scooter. Would love to win this for my little daughter. She is mad on scootering in fact we are to. Love it. I would give it to my beautiful grandson Cole. I'd give it to my grandson. He would absolutely love it! I would love to win this for our son Jack. For my great niece in South Africa. I am sure she will share with her sister too.